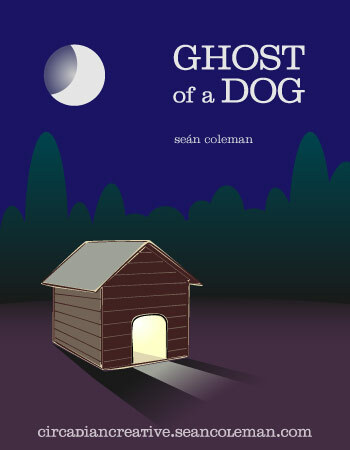 Book Cover Design Project #30 – Ghost Of A Dog. “Ghost Of A Dog” – Is a short story written by yours truly. I wrote the piece a couple of years ago while reminiscing of one of my family dogs from when I was a child. I refined the story a bit this past winter when I started a personal blog as I thought it would make a nice story to share. Here is the link and I encourage you to read the story as I believe it conveys quite nicely with the imagery of this book cover design. Typography – I chose Clarendon light to set the title. Initially I chose Clarendon Bold but thought it made the presence of the title too over powering. I also chose to emphasize the words ghost and dog by setting them in all caps and setting everything else in lower case, including the author’s name. Imagery and Color -The story describes a Summer evening so I chose that as the setting for my illustration. I used deep dark blue for the sky, a gradient consisting of dark green and dark, almost black, plum to add some depth to the background trees. I used the same dark plum color graduating to a lighter shade to convey the ground as it transitions from background to foreground. I used additional gradients to create the illusions of shadow and light. The image conveys one of calm solitude except for the glow emanating from within the dog house. Again, read the story to get the rest of the picture. Actually the goal of the imagery is to compel viewers to want read the story so I hope I have achieved that aim. Well, that’s it for today and that is it for the Book Cover Design Project. Tomorrow I will move on to another series. I am thinking of calling it Brand, Re-brand. The goal would be to design logos for fictitious products or organizations, or to create redesigns for existing ones. What do you think? Sound fun? Participate: I am always accepting ideas from readers. Currently I would like to hear ideas on the next design project theme. The Book Cover Design Project ends on June 30th so if you have ideas on the next theme please let me know. Help me promote this site! If you are on Facebook please add Circadian Creative’s Facebook page to your “liked” pages. If you log into Facebook and do a search on Circadian Creative it will come up at the top of the list. I update the page daily after each post here and I have also archived the daily designs by month in the photo section. 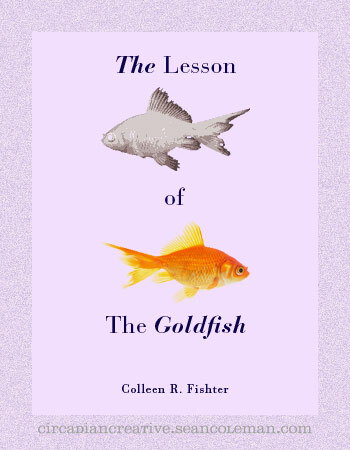 “Lesson Of The Goldfish” – Is a short story written by one of my favorite writers. OK, she is my favorite writer. Her story describes how she is reminded of one of life’s bitter sweet lessons as she pauses to watch a young boy leaving a local pet store with his mother. He is carrying a plastic bag containing a goldfish. You will have to read the story yourself here. Typography – In this design I chose to change the title slightly by adding the article The at the beginning of the title. I wanted to add a visual degree of separation between The Lesson and The Goldfish. I believe I achieved this by setting the first instance of the word The and the word Goldfish in a bold italic weight and setting the second instance of the word The and the word Lesson in a regular weight. This creates a separation of the two concepts but retains their relationship to one another. The typeface is Bauer Bodoni, regular, and bold italic. Bodoni is classified as a modern typeface due, in part, to it’s clean geometry and straight, unbracketed serifs, but the face was first designed in the late 18th century so it conveys a traditional feeling as well. Additionally the typeface demonstrates a contrast in it’s structure which is comprised of alternating thick and thin lines. I thought this contrast in the typeface fit with the contrast in the Lesson Of The Goldfish, which is the joy of caring for life followed by the sorrow of loss that comes in death. Imagery and color – I chose a lavender color for the background which is sort of a cross between blue for boys and pink for girls. I hoped to capture a gender neutral representation of childhood color. The images of the goldfish symbolize both states of the lesson. The top image is the gray lifeless impression of the lesson and the bottom is the goldfish still alive. Well that’s it. Hope you like! “On A Side Note…” – This phrase is used as a segue to transition from one conversational topic to another. In the following composition I used the idea of notes, musical notes, to create a somewhat literal interpretation. The impression of a musical note laying on it’s side with the title set vertically above (on) it has nothing to do with the meaning or usage of the phrase. But, perhaps some will find the concept cute or amusing in some way. Although I try to oppose myself from such notions, sometimes design is cute and amusing. Just want to prove that I am capable of executing the concept. And that’s all I have to say about the design. hope you enjoy. Book Cover Design Project #27 – Home Sweet Home. “Home Sweet Home” – I just returned home earlier today and I am enjoying some couch time with Colleen, the kitties and a Criminal Minds marathon on A&E. So this is another quick composition which I am presently too tired to talk about. Hope you all like it. Also, please read the reminder paragraph below. I usually re-paste it to every post but I have updated it today so I want to make sure all you regulars don’t skip over it today. “A Family Affair” – Today I’m going to a Family reunion. So I let the theme of my day inspire the theme of my design submission. I used the image of a tree as it is often utilized in the symbolism of a family in terms of signifying multiple generations and heritage. I used a soft light green color to contrast against the dark barren tree image. The empty branches of the tree represent the family structure and lineage, the greens of the background signifies the lives surrounding that structure, this includes the memories of those who have gone before. I chose Adobe Jenson medium as the typeface for the title. I like it’s traditional characteristics. It seems to borrow a bit from Garamond but with just enough of a distinguishing edge. I really like some of it’s italic features, which are not present in this design. Reminders: I am always accepting submissions for words or phrases. If you would like to see me design something around yours, submit it in the comments area below. Also, If you are on Facebook please add Circadian Creative’s Facebook page to your “liked” pages. If you log into Facebook and do a search on Circadian Creative it will come up at the top of the list. I update the page daily after each post here and I have also archived the daily designs by month in the photo section. Book Cover Design Project #25 – The Call Of The Open Road. “The Call Of The Open Road” – I would love to have time to research this phrase, but I am in the middle of preparing for a road trip this morning. I pulled this composition out of my “trunk” so to speak in about 20 minutes. So, if you think it looks like crap then that’s my excuse. And if you think it’s brilliant, well, then that’s just how I roll! Actually, the image in the layout is how I roll – Mustang convertible baby! Only I am driving the previous body style in black and today I will have my traveling companion, the lovely Colleen at my side! And, it’s going to be rather hot so I think having the top up with air conditioning will be the way we roll, at least until we get into the mountains and then we’ll reassess. I used a stock Ford photo and over saturated the colors. I then posterized it to reduce it to about four or five colors. For typography I almost chose Clarendon which I think might have been used for the very first 1964 Mustang logo. But I then chose Bauhaus at the last minute. I call it that 70’s font and when I think of the 70’s I often think of summer for some reason. Anyway, That’s it for now, that open road is calling so I need to answer. Tomorrow I will be posting from Wild, Wonderful, West Virginia! Book Cover Design Project #24 – The Straw That Broke The Camel’s Back. “The Straw That Broke The Camel’s Back” – I am a bit rushed today so I made quick work of today’s design as well as the research on the phrase. This phrase appears to originate from an old Arabic expression. Makes sense since it deals with camels and many camels are from the middle east. The camel is a beast of burden like the horse is here in the west. Heavy loads are often carried by camels including bails of straw. The modern day phrase is used to describe the last in a series of unacceptable or undesirable occurrences. This is also the origin of “the last straw” or “the final straw”. As I mentioned I felt a bit rushed today so I created this layout very quickly. That’s not to say that I don’t like it, I do. I guess I didn’t experiment much with color or composition options. The image is processed from a photograph that I found of a camel skull in the desert. I reduced the image to five or six colors to give it the appearance of an illustration. I used a roughened display type called Cracked to set the title and used variations in point size and baseline shift to add a little visual interest. Rotating the title parallel to the horizon line of the image helps add further to the visual interest. And that’s about it for this one. As always, I hope you like it.